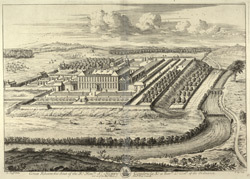 View of Great Ribston, Yorkshire, from "Britannia Illustrata". This monumental work illustrating country houses and their gardens was published in two volumes in 1720 and 1740. The original drawings were made by Leonard Knyff, a Dutch artist who came to England during the 1670s. Knyff's drawings were engraved by his fellow ex-patriot Johannes Kip.